I can’t believe it almost a month since Heritage Camp ended. It was another memorable weekend filled with storytelling, music, family, friendship and sunny weather. Many thanks to all the Coordinators and Staff. Without you there would be no camp. I always look forward to returning to the mountains to learn about my birth culture, visit with old friends and make new ones. This year’s camp theme was “Chasing Dragonflies.” We explored the Vietnamese creation story and other Vietnamese fairytales. 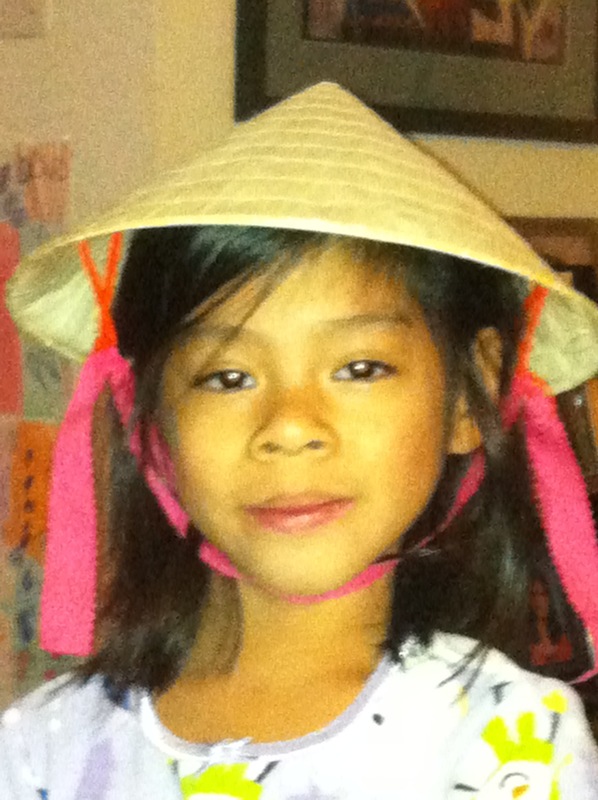 The kids made dragonfly kites and Vietnamese spring rolls. It was so nice to have ATG’s very own Hue Dao Miner join us again. 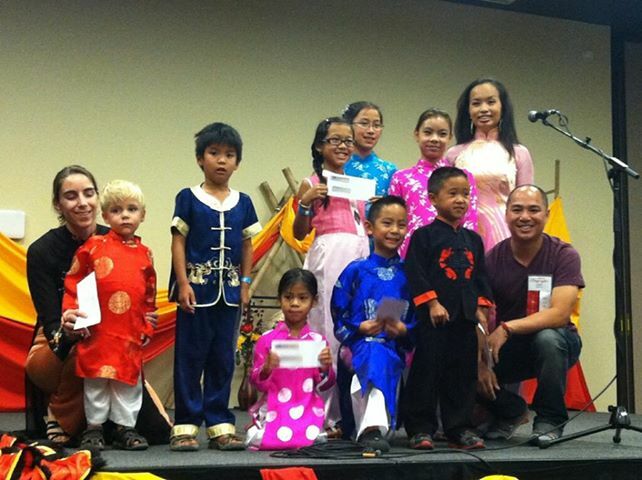 Hue worked with the kids to teach them a traditional Vietnamese dance. 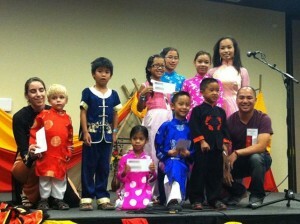 All the age groups performed with Hue at our Saturday night show. Many thanks to Co-Director, Kristi Kremer, who put together a great camp with me this year. I will be returning as Co-Director for one more year. I’m happy to announce two new camp Co-Directors joining me, Veronica Thompson and Ethan. Camp was extra special for me this year. My parents, Rick and Rita Rehberg, attended camp as guest presenters. It was so exciting to see my parents give a workshop on raising a multicultural adoptive family. 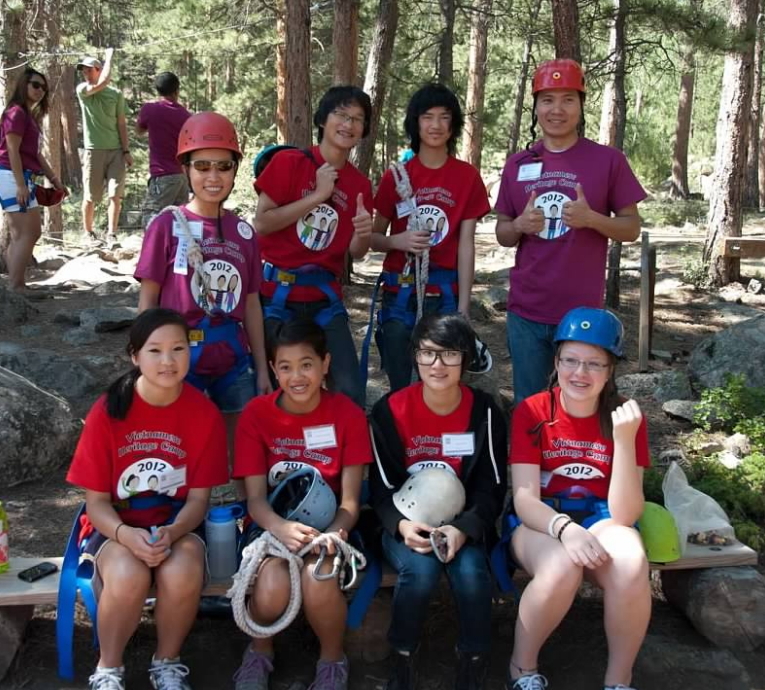 Their 30 plus years of experience offered a new perspective to the family of campers just beginning their journey. Thank,s Mom and Dad. Saturday night’s carnival and gala was so much fun. 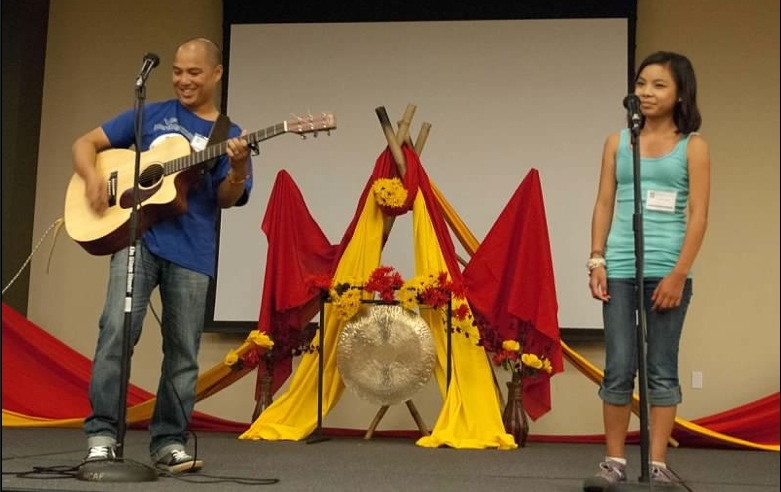 I had the honor to share the stage with fellow camper and adoptee Noelle Hemphill. ATG’s Hue Dao Miner joined me on stage again to announce the winners of our 2013 ATG Heritage Camp Scholarship Contest Winners. Our amazing counselors surprised us with a gorgeous candlelight dance. Our evening ended with a surprise dance party. This event will be official next year. Sometimes, you just need to dance! ATG is proud to announce the winners of the 2013 ATG Heritage/Culture Camp Scholarship Contest. Many thanks to all of our campers who submitted this year. Check out how our winners go ‘Against The Grain‘ and what going ‘Against The Grain’ means to them. Congratulations to our winners! Zoe is six-years-old and will be in first grade this fall. She was born in Phu Tho, Vietnam. 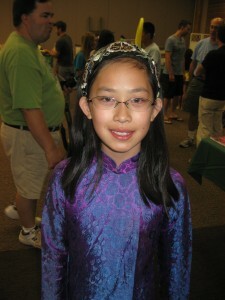 She is very proud to be from Vietnam, and her kindergarten teacher told us that she talks about Vietnam all the time. She took in her baby book and showed the Vietnam photos to her entire class. When the class wrote a book together at the end of the year, choosing the setting, characters, etc, they decided the story should be set in Vietnam! What does against the grain mean to you? In our family, going “Against The Grain” means being yourself. It means that you are not afraid to be different. It means not doing or liking things just things just because someone else likes them. 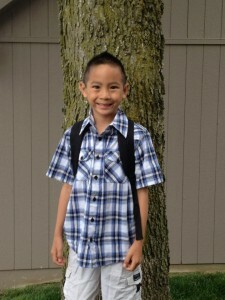 Colin is five-years-old and will be in kindergarten this fall. He lives his life against the grain. 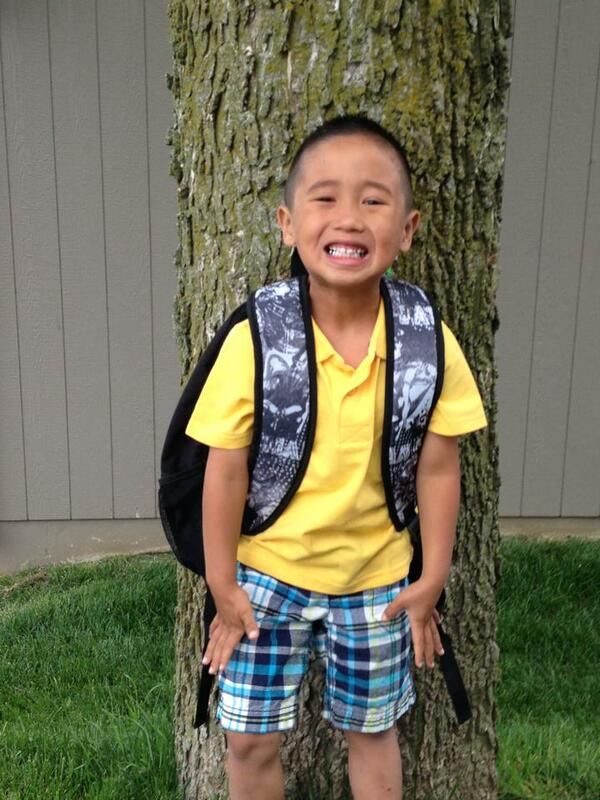 He was adopted at birth in the U.S, and his family is a little different than most. While he loves with his mom, dad, brother and sister, he also loves to see his “Mama Amy” (his biological mom) and his biological brother and sister, too. He proudly says, “Mommy, I have two mommies!” He is a daredevil, and he is very competitive. He likes to run the hardest, ride his bike the fastest and jump from the highest heights. He loves to be silly and will do anything to make people laugh. Unlike most five year olds, there are few mainstream cartoons that Cato is willing to watch. Instead, he often prefers science and nature documentaries (“if they aren’t too scary”) or cooking shows. It is not uncommon to find him hypnotized by Chef Jaques Pepin or asking us, “What’s a worm hole?” He has an exceptional aptitude for this. 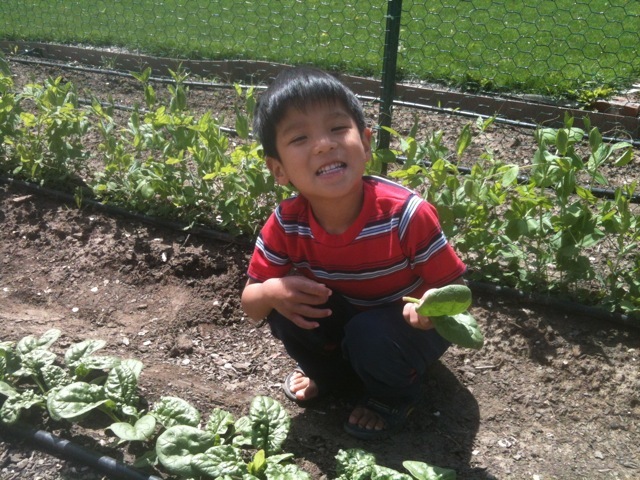 He could name most of the flowers and vegetables in our garden and tell you all about the solar system. Doing things differently than others. 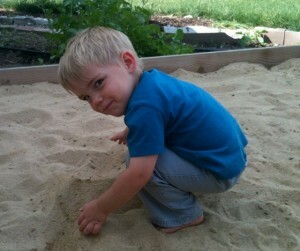 Reuben always looks for new ways to make his brother and parents laugh. He likes to experiment with silly walks like sideways galloping or twisting struts. 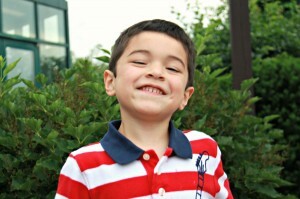 He likes to make new sounds or use familiar words in new settings to get a laugh. I would ask for help or directions – like from the police or a crossing guard. It means cutting through the grain when the grain is so strong. I am against the grain because I believe that being yourself and being truthful about who you are is very important. That being someone else just to fit in is not as good as just being you. Just be yourself and you will go a lot farther than those that pretend. For example I am different because, I am adopted, I am small, I am Asian, I like to do different things, I act different, I listen to different music. I may not be as outgoing as the other people at my school, but that’s okay. I do not change these qualities of myself, because that’s what makes me different and special. I just go with what feels right to me and what I feel is important in my life. I try and not focus on what others think of me. This can be hard, and everyone has their own struggles, but being different is cool. That’s how I go against the grain. I stay true to who I really am. “Against The Grain” to me means that you are different than other people, but you are okay with that. That you aren’t exactly like the others. You do things in your own way and you don’t try and be someone you are not. You are strong and don’t let others get under your skin about who you are or how you don’t fit in. You are just you. Well, like, I like to play batman even though Eliott doesn’t like to. I guess not do do what someone else does, especially mean guys. I don’t fight somebody…or I don’t know…I just don’t do things just cuz my friends do. To not do what everyone else does…or something. 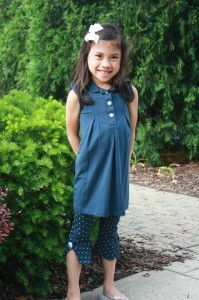 Some of the things that I do that are against the grain are that I don’t wear the same clothes that other kids wear. I don’t talk in class when other kids are and I put my best in every project. I can spend hours doing origami and crafts and when I see something that I like, I research on-line and learn how to make it myself. “Against The Grain” means not doing what everyone else is doing. I go against the grain when my friend Ryan wants me to sit with him at lunch, but he does not save a seat for my best friend Shefali. I have to go against Ryan and say I would like to but only if you save a spot for Shefali, too. Also, when I’m at school and want to play 4 square, people are always making teams and being mean to each other. When people ask me, I say no, it’s not right to gang up on people. Going “Against The Grain” means going against the crowd. Going “Against The Grain” means you should be independent and bold. 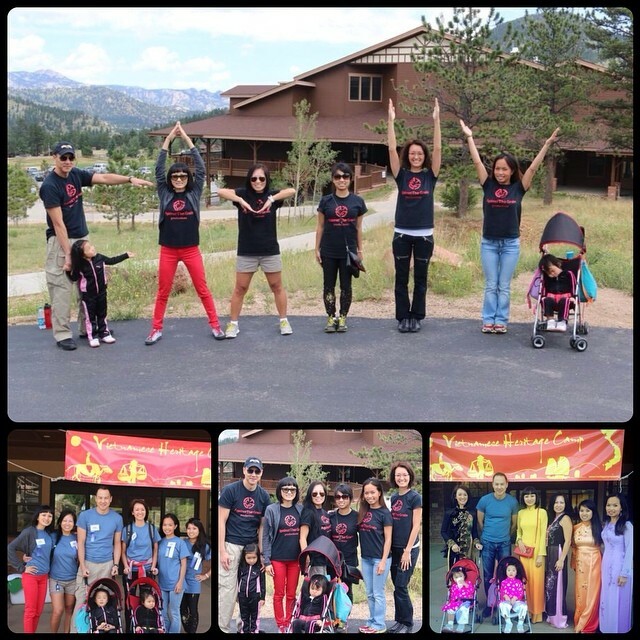 Here are some of our winners from the 2013 Vietnamese Heritage Camp in Colorado. Dallas, TX – After a year of planning and the final three months of execution, ATG’s own Director of Community Outreach, Jared Rehberg, marked his first successful year as Co-Director of Vietnamese Heritage Camp, hosted in Estes Park, Colorado. ATG Secretary Hue Dao Miner joined him as a High School counselor, becoming an instant role model. ATG had a special table set up for the Saturday night show that featured performances by the children and workshop presenters. Jared had the honor to make a dream come true by sharing the stage with two younger adoptees. He performed “Someone Like Me “with Kali Hauck from Boulder, Colorado. 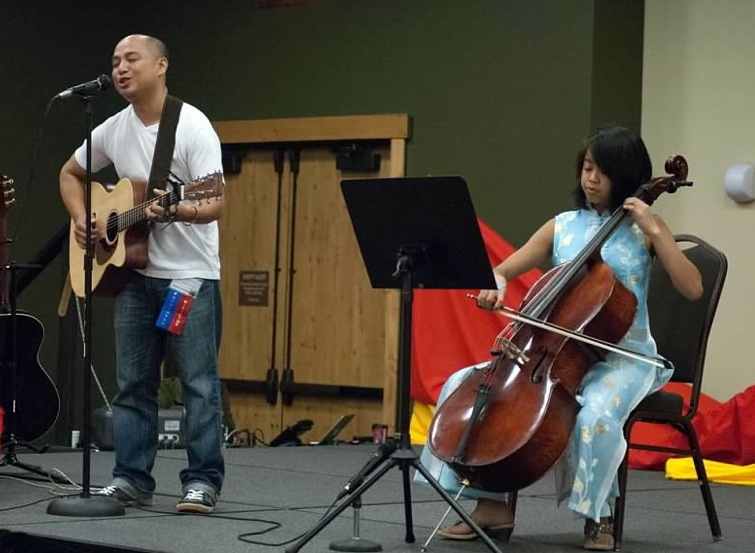 He also sang “Connected to You” with cellist Noelle Hemphill from Fort Collins, Colorado. The weekend went by quickly, and both Jared and Hue miss the families already. Jared is excited to start planning next year’s camp with his new Co-Director, Kristi Kremer. This year’s winner were Olivia Thompson, Noelle Hemphill, Maria Kremer, Thomas Anh Huy Morton, Liz Boyle, Allison Foust, Sarah Foust, Hannah Foust and Emily Morgan-Tracy. Congratulations to all the winners! 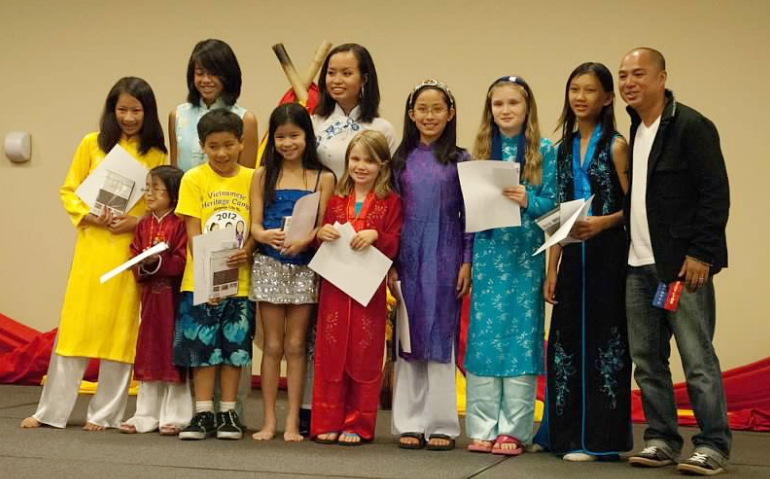 Congratulations to our Vietnamese Adoptee Heritage/Culture Camp Scholarship Contest Winners! What does ‘Against the Grain’ mean to you? It means embracing our differences and being proud of what I am, and not to worry about whether I’m just like everyone else, because I’m not. I’m Asian-American in a country where most people are not. I’m Vietnamese in a country where most Asian-Americans are not. I’m Jewish when most Vietnamese are not. So I have to go against the grain, whether I want to or not. That will be hard to do sometimes, but will be rewarding in the long run because I can be a smart, creative, beautiful, and compassionate, and unique person, and don’t have to follow the pack or be like everybody else. The fact is, I’m NOT just like everyone else, thank goodness. I try to learn new things every day. I throw myself into lots of things: gymnastics, music, science, coloring, mathematics, swimming, school, and more. Some day, I’ll figure out what I do best, and what I love, and how I want to find my own path to a fulfilling life. Because I am different from others, I know that my path doesn’t have to come from following everyone else, but will come from learning what I can from those I love and respect, and from my own talents and interests. ‘Against the grain’ means to me that you try things differently than everyone else. It means you do not back off when someone tells you that you can not do something. I am one of the shortest boys in my class. 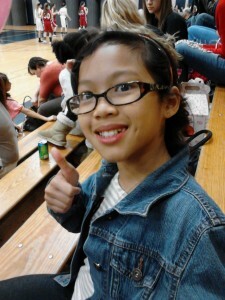 I go ‘against the grain’ and try different sports or contest when the other boys say I am too short. What does ‘Against The Grain‘ mean to you? Doing what’s right for our family, even if it’s not the norm or what other families are doing. Doing whatever I can to help Aiden feel connected to and be proud of his Vietnamese heritage and the Vietnamese culture….even if it means missing family events to attend events with other Vietnam adoptive families; going to events at our local Buddhist temple or at our Vietnamese American Community Center where I am the minority and my son is not; making culture camp our one family vacation this summer and hopefully every summer. Not conforming to everyone’s ideas and holding your own ideas and staying steadfast to them. Not being influenced by others and doing research for myself and believing in what I do. I like to do community service and help others. I think against the grain means to do the unexpected or unusual; what you feel is right. I go against the grain by being a member of the Natural Helper program in my school.